English Minnits is a learning game, aimed at helping students learn English by improving their vocabulary and listening comprehension. The game is owned by Universal Learning Games and was developed by Sigma Technology and Sigma Software in 2014. The game has pixel-perfect graphics and 3D characters, making the process of learning fun and engaging. The game is available on desktop and tablets. It is currently deployed at schools in Sweden, Germany, Denmark, the Czech Republic, Spain, and Colombia and will be soon integrated into the curriculum of over 20 Indian schools. Karl-Oskarskolan school was one of the first schools to use the game English Minnits in the learning process, and they already have great results. Last week they got the certificate for the highest score in the game. 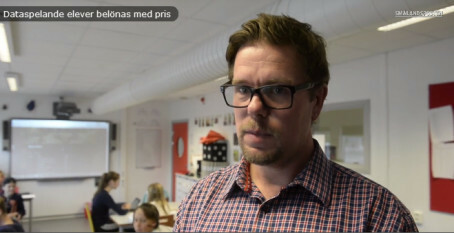 See the Smålandsposten’s TV-report (in Swedish). “We are sincerely happy for the record of Karl-Oskarskolan school. Their example motivates us to improve and develop more learning solutions for the students. Later this year we are releasing a new version of English Minnits, and next year we are going to present a new learning product,” shares Jonas Lidén, CEO at Universal Learning Games AB. “We are excited to see how the product we developed helps students master their English skills. It proves that the game concept we were all working on proved to be successful,” shares Daniel Björkman, Vice President at Sigma Technology Solutions. For more information, please visit the Minnits website or contact Daniel Björkman.